NEW YORK (CNNMoney) — U.S. stocks pared earlier gains Tuesday following reports that German Chancellor Angela Merkel rejected the idea of increasing Europe’s bailout fund. At midday, the Dow Jones industrial average (INDU) was up just 59 points, or 0.5%, and the S&P 500 (SPX) gained 5 points, or 0.4%. 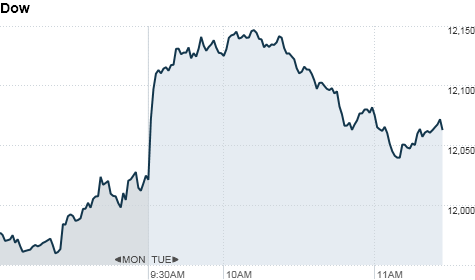 The Nasdaq briefly drifted into the red, but recovered to rise 2 points, or 0.1%. All the major indexes started the day about 1% higher. The pullback came after a Dow Jones report said that Merkel has rejected suggestions to raise the funding limit for the European Stability Mechanism, or ESM, which currently stands at €500 billion. The fund goes into effect next year and may run alongside the €440 billion European Financial Stability Facility. U.S. stocks started the day with solid gains thanks to an initial void of bad news out of Europe. Though political leaders have been taking steps toward a resolution for the region’s debt problems, the details have yet to be worked out. “All eyes are still on Europe,” said Tim Ralph, portfolio manager at Biltmore Capital. Official meetings and statements will be minimal as the year come’s to a close, but Ralph said that the market remains vulnerable to headline risks. Investors are on watch for possible downgrades on European country credit ratings from Standard and Poor’s, which warned last week that it may strip some of Europe’s biggest economies, like Germany and France, of their AAA-rating. Investors are also waiting to hear what the Federal Reserve will say at the end of its policy-making meeting. U.S. stocks tumbled in a broad sell-off Monday, amid growing investor doubt that Europe’s debt crisis will be resolved, and a sales warning from chipmaker Intel. World markets: European stocks finished mixed. Britain’s FTSE 100 (UKX) ticked up 1%, while the DAX (DAX) in Germany fell 0.3% and France’s CAC 40 (CAC40) edged down 0.8%. Asian markets ended lower. The Shanghai Composite (SHCOMP) lost 1.9%, the Hang Seng (HSI) in Hong Kong shed 0.7% and Japan’s Nikkei (N225) declined 1.2%. Companies: Former MF Global (MFGLQ) CEO Jon Corzine is back to testify before Congress Tuesday, this time flanked by two former colleagues from the brokerage’s parent company, MF Global Holdings: Chief operating officer Bradley Abelow and chief financial officer Henri Steenkamp. Shares of electronics retailer Best Buy (BBY, Fortune 500) got slammed after the company reported earnings that fell far short of forecasts. Intel warned that it will badly miss its sales forecast for the current quarter on Monday, because of the worldwide hard drive shortage caused by massive floods in Thailand. Shares of Intel (INTC, Fortune 500) dropped nearly 4% in trading Monday, and continued to slip on Tuesday. Netflix’s (NFLX) continued to rise, on chatter that the company could be acquired by Verizon (VZ, Fortune 500). On Monday, a spokesman for Netflix said the company doesn’t comment on speculation. Economy: Retail sales for the month of November rose 0.2%, which was lower than expected, according to the U.S. Commerce Department. But the disappointing report had little impact. Sales were expected to have increased by 0.6%, after a 0.5% increase the month prior. Investors are also awaiting news from the Federal Reserve, which is expected to hold interest rates at 0.25% for the month of December.